When it comes to escaping the heat of New York City, New Yorkers often flock to the beaches or shaded woods of Central Park, but many travelers overlook destinations on Long Island that offer a quick getaway from the city and the summer sun. Fortunately, along with the Metro Transit Authority (MTA) subway trains, New York City also provides public transportation options to and from Long Island aboard the Long Island Rail Road (LIRR), making it rather easy to get to some of the state's best beaches, private resorts, and even a few water parks. As far as water features go, though, there are none quite like Splish Splash Water Park in Calverton, Long Island. From its kiddie attractions to the wave pools to New York State's only water coaster, Bootlegger's Run, the park brims with exciting, thrilling water-themed rides that will keep you cool during the hot weather. Although many tourists spend all of their time in New York City on the island of Manhattan (home to Broadway theaters and New York University), many often miss opportunities to explore nearby destinations offering unique entertainment, attractions, and events—especially those accessible by the LIRR on Long Island. In fact, many tourists may not even know there are several stations for the LIRR in New York City including at Penn Station in Manhattan, Long Island City and Jamaica Station in Queens, and at the Atlantic Terminal in Brooklyn. You can actually access the LIRR at Penn Station via the A, C, and E subway lines; Atlantic Terminal via the 2, 3, 4, 5, B, D, Q, and R lines; and Jamaica Center Station via the E, J, and Z subway lines and Airtrain from John F. Kennedy (JFK) Airport. The LIRR provides services along nine different routes into Brooklyn, Queens, and Long Island. Trains depart according to a daily schedule, which you can access via the Long Island Rail Road website. In addition to all the excitement of the park, there's a way to save some cash on a family outing to the venue if you're traveling here from March to October. The LIRR offers a package deal that includes your ride, a shuttle bus, and water park admission, with a savings of up to 27 percent on the regular price. The LIRR Splish Splash Package price is $69.25 for each adult and $54.50 for each child, ages 4 through 11 (must be under 48 inches tall). Purchase the package with cash, a personal check, or credit card at any open LIRR ticket office. You can also purchase it at LIRR full-service gray or blue ticket machines. Select the "Deals & Getaways" button on the first screen, and then choose "LI Getaways" and select the package. Both the blue and the gray LIRR machines accept debit and credit cards, and the gray machines will also accept cash. After purchasing your package tickets, you will then take the Long Island Rail Road (LIRR) to the Ronkonkoma Station. You can board a train to Ronkonkoma from Penn Stations, Atlantic Terminal (Brooklyn), Woodside, Kew Gardens, or Forest Hills, and there is also a train from Jamaica that costs a little less for the whole package. On Long Island, trains to Ronkonkoma leave from Hicksville, Bethpage, Farmingdale, Wyandanch, Deer Park, Brentwood, and Central Islip—all of which offer reduced prices for the getaway package. Once you arrive at Ronkonkoma Station, you'll board an air-conditioned North Fork Express Bus directly to the entrance of Splish Splash Water Park. You can then present your getaway package ticket to the front gate and spend the rest of your day enjoying the water, waves, and sun. Keep in mind that this is a special summer getaway package that is only available on weekends and holidays through the beginning of September. Rail tickets are valid and refundable for 60 days from the date of sale but subject to a $10 refund processing fee per transaction. To get travel information on the LIRR schedules page, search for the name of the station you are leaving from and the approximate time that you will be traveling. You can also call 5-1-1 and say, "LIRR." Whether you're traveling with family or looking for a great way to spend a hot day with a group of friends, this Long Island attraction is a great getaway within a few hours of New York City. 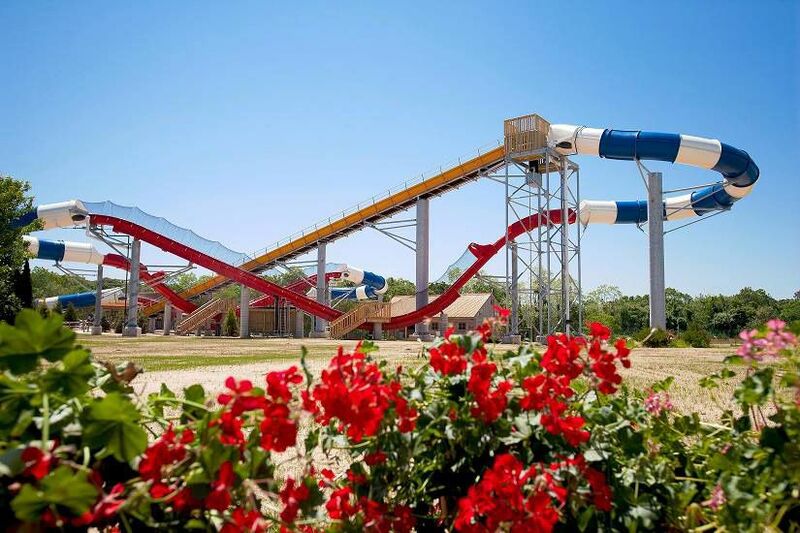 Simply buy a getaway package, hop on the Long Island Rail Road, and get ready for a day of family-friendly fun and a splashing good time at Splish Splash Water Park.